You will see a lot of pictures from different places in this talk. I will hold a talk on snow leopards and the adventures with this cat on 4 February. The talk is at 18:00 in Naturum Värmland in Karlstad, western Sweden. The talk is in Swedish and costs 60 kr. It is open to the public and you are very welcome to come and listen! 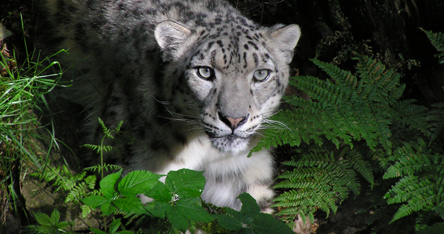 We have created a Facebook page for the snow leopard book, due in the fall of 2014. On the Facebook page you can read more on our work with the book as we will update it with our progress. 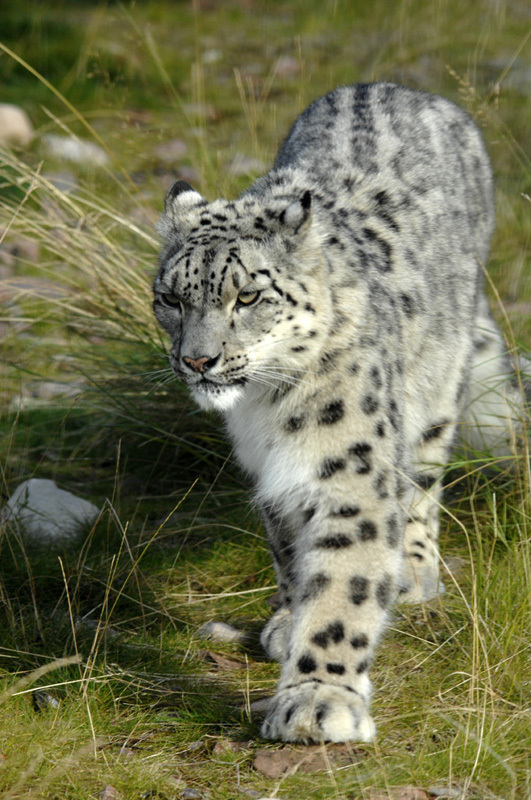 Jan has just, for instance, come home from northern India seeing several snow leopards and getting really good pictures! The book will first be published in Swedish with an English version hopefully coming later. 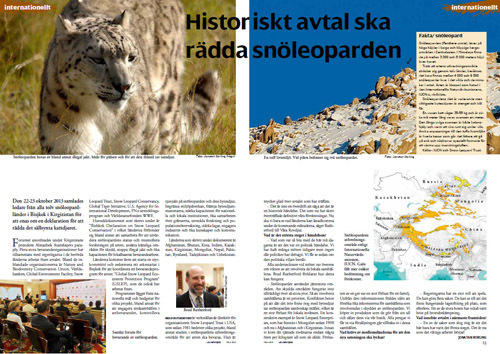 There is an article on the snow leopard forum in the latest issue of Våra Rovdjur (nr 4/2013). 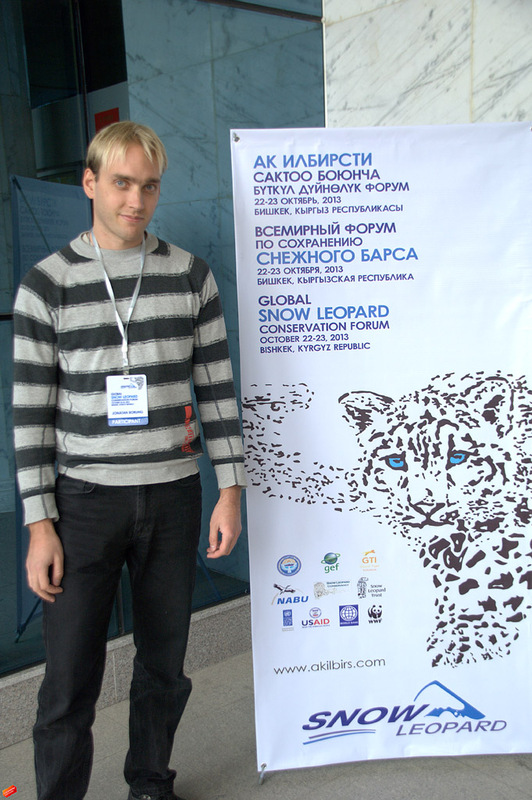 I interview Brad Rutherford, director of the Snow Leopard Trust for the article. The article is in Swedish. There is also an article on the Iberian wolf in the magazine where I interview José Lopez. You can read the full article on the Iberian wolf here. 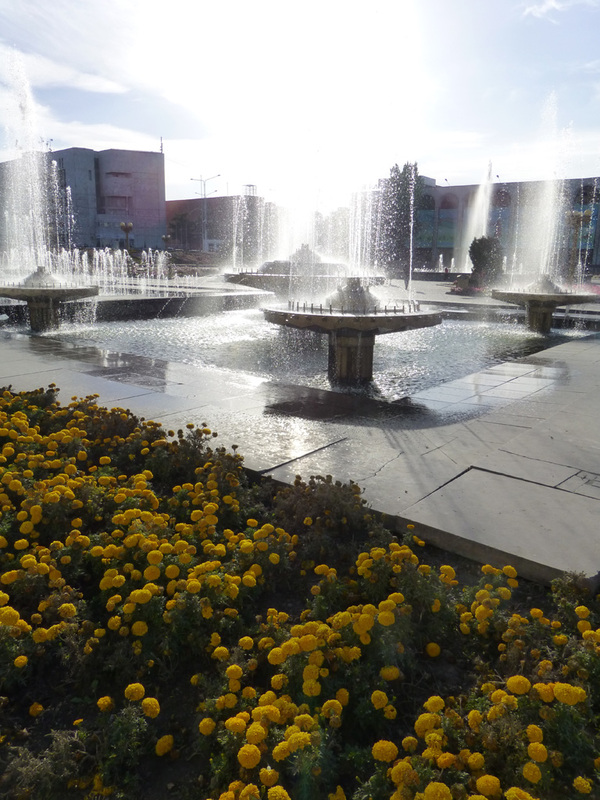 Bishkek is the capital of Kyrgyzstan and lies just next to the vast Tien Shan mountain range. On 19 to 26 October I traveled to central Asia to the country of Kyrgyzstan to participate in the Global Snow Leopard Conservation Forum. 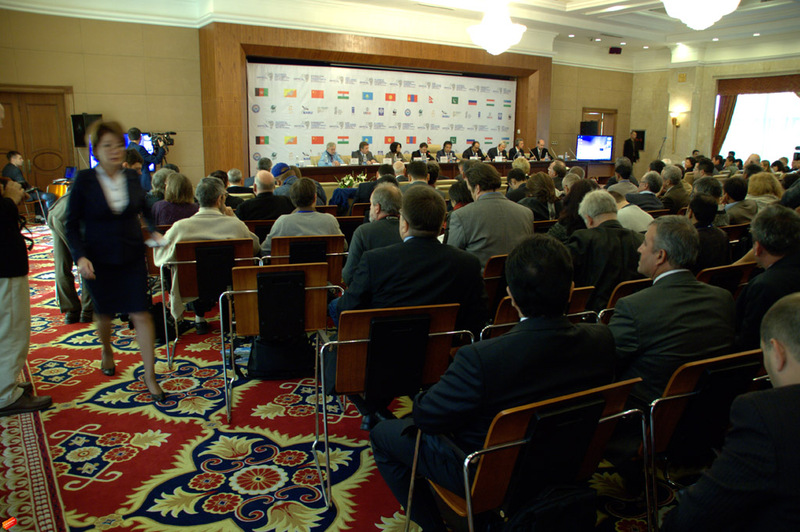 Leaders from all twelve snow leopard range countries agreed to a declaration to save the species from extinction. The seminar was hosted by the president of Kyrgyzstan, Almazbek Atambayev in cooperation with organizations such as the World Bank, Snow Leopard Trust, Snow Leopard Conservancy, WWF, NABU and others. One of many seminars and discussions at the Global Snow Leopard Conservation Forum discussing the conservation of the big cat. The country delegations agreed on the final draft and the agreement was signed on 23 October. Along with the declaration, the countries also agreed on an action plan, the Global Snow Leopard and Ecosystem Protection Plan, which deals with specific plans on how the goal is to be reached. After the forum I spent a full day in Ala Archa National Park. It is beautifully situated in the Tien Shan mountain range. On my way back from Kyrgyzstan I stopped by in Istanbul in Turkey for a full day exploring the city. Situated just in between the Sea of Marmara and the Black sea, it is the connecting point between Asia and Europe. Exploring Istanbul was very nice although the city’s vast tourism industry takes a bit of the charm away from it. 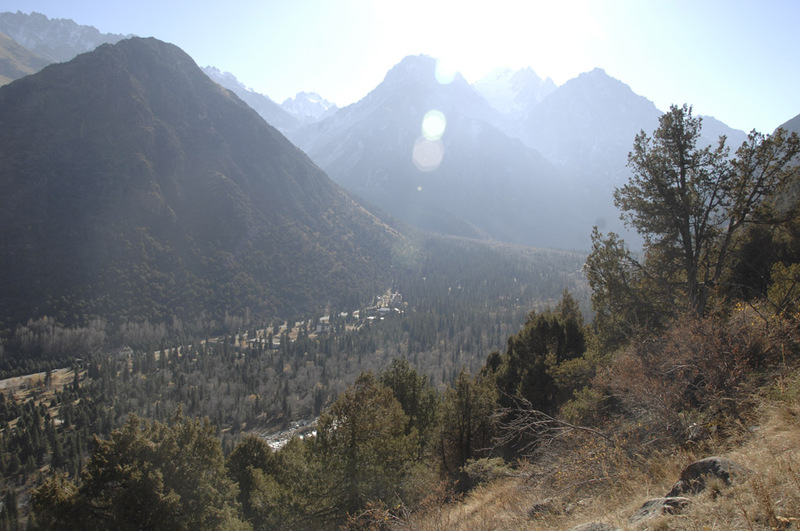 I spent a full day walking around in Ala Archa National Park which is situated just 40 kilometers south of Bishkek. Some peaks reach to nearly 5 000 meters above sea level. I am next to one of the signs of the forum. I had a field day last Monday at Orsa Björnpark taking pictures of snow leopards to complement our pictures of wild snow leopards for the book on the species that we are working on. I was there for four hours and got some nice shots. Meanwhile my colleague Jan Fleischmann is in Stockholm meeting people and doing interviews for the book. Work is progressing.